The holidays are fast approaching, and with them, wintry weather. Snow, ice, and freezing temperatures can really take a toll on a home, causing expensive damages and high utility bills. 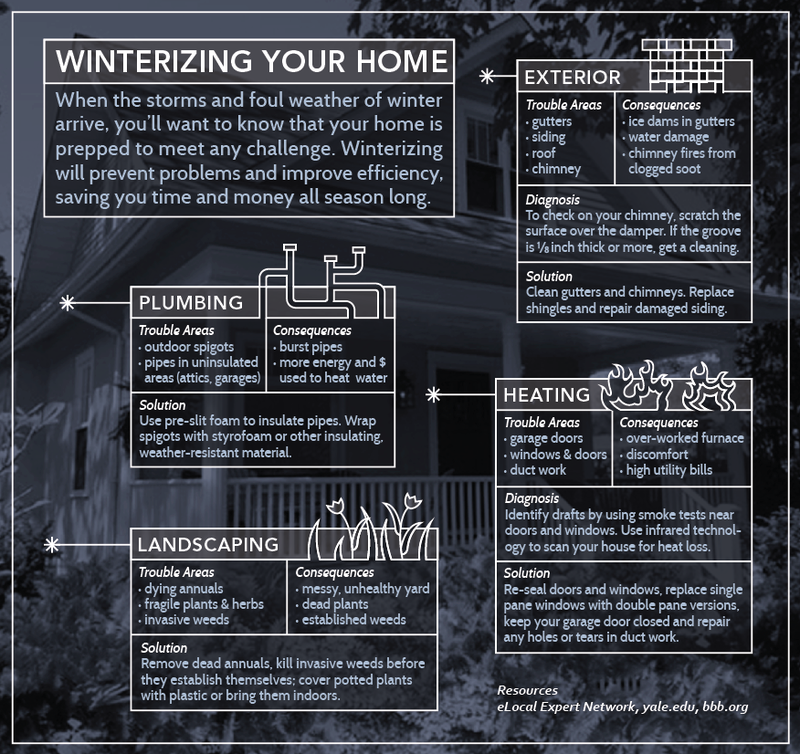 Winterizing your home can help prevent unexpected surprises, such as busted pipes, and will help with energy costs. A few simple tips to winterizing your home can help make sure that your holiday feasts with friends and family are warm and cozy. Pipes are very susceptible to freezing, and repairs can be extremely expensive. Learn how to shut off water valves in case a pipe burst. Exposed pipes in uninsulated spaces such as attics and crawlspaces should be wrapped with electrical heating tape and insulated with foam insulation. **If you are leaving your home unoccupied for a season, you should shut off the water supply and drain the pipes. A water leak in an unoccupied home can cause catastrophic damage. Check your wood-burning fireplace or stove to make sure that it is working properly before winter. Loose bricks or missing mortar should be replaced or repaired to prevent fire from spreading into the wall behind the fireplace. Test the flue damper to ensure that it is operating properly. Check your chimney for obstructions, and make sure that it is clean, hiring a professional if needed. You can test the chimney draft by lighting some newspaper and checking to see if the smoke rises properly. Test your heating system/furnace BEFORE the weather turns cold. It is best to have your system inspected before use to evaluate it for safety and efficiency. To test your system, turn the thermostat to HEAT and allow it to complete a full heating cycle, from turning on and blowing hot air through the vents to shutting off the blower again. Inspect ductwork for mold, dirt, debris, holes and loose connections. Contact a service technician for any repairs. Be sure to properly maintain your heating system, replacing air filters regularly (according to the recommended schedule) and checking for carbon monoxide leaks. If your thermostat is old, replace it with a newer model that may be programmed to lower the temperature when you are not at home or asleep. Efficient insulation can save a great deal on utility bills. If you are unsure whether or not you have sufficient insulation, schedule an energy audit. Your utility company might provide complimentary audits. Exterior outlets may be insulated with foam sealing gaskets. Cover your water heater with blanket insulation or a cover, according to the manufacturer’s instructions. A great deal of heat may be lost through drafty doors and windows, and can contribute to high utility bills. Inspect window glass to make sure it is whole and secure in its frame, and inspect doors for stability, replacing and repairing when needed. Before cold weather arrives, check for gaps around windows and doors. Gaps are easiest to see at night when there is light on one side and dark on the other. Fill gaps with silicone caulk or spray foam insulation designed for windows and doors. Install new weather stripping under entry doors and around windows and, when possible, replace screens with storm windows and doors. Close those blinds. Closing your blinds, shades, and/or curtains at night adds another layer of insulation to those windows; it helps to keep the cold air out and the warm air in. Cover those walls. Did you know that you could help insulate your home and reduce energy loss by covering your walls with framed pictures, mirrors, tapestries, or —best of all— bookshelves? Bookcases full of books make a great barrier —helping to keep that cold air outside where it belongs. Move that furniture. Simply moving furniture (sofas, beds, desks, etc.) away from the cold exterior walls can help you feel warmer. Clean that roof. To maintain proper insulation and to prevent damage, you need to remove excess snow from your roof. Using a “roof rake” while standing on the ground makes this a far less dangerous task. 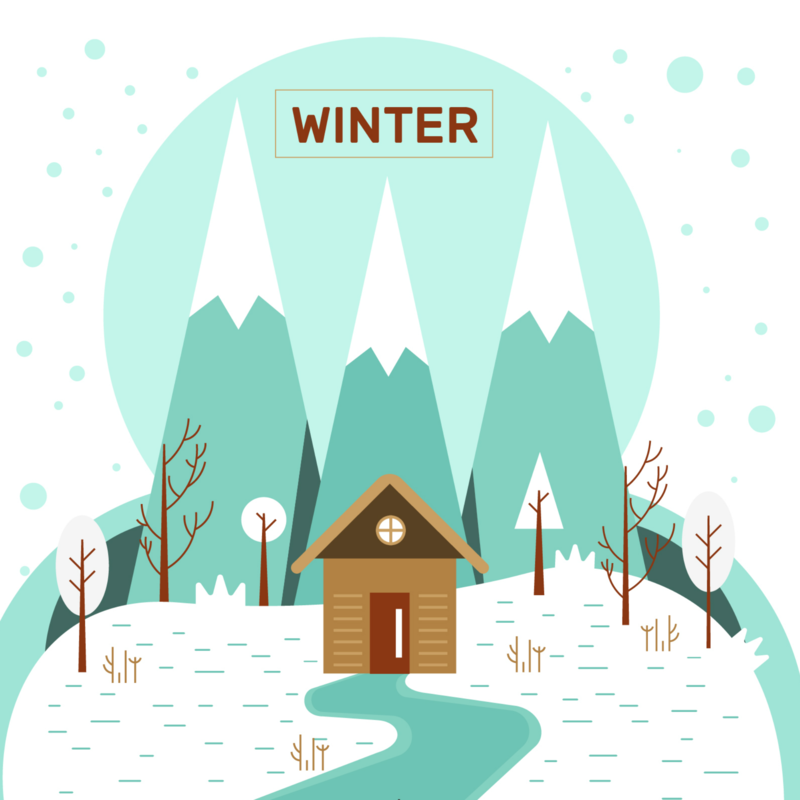 Are you prepared for a Winter Weather Emergency?